A "Super White Army" banner was covered up during an England football match after a picture with it in was shared online by one of the team's players. The sign at Tranmere Rovers' ground was obscured by the FA for the Lionesses' World Cup qualifier, hours after Lucy Bronze shared the photo online. People responding to the post suggested the banner could be seen as racist. 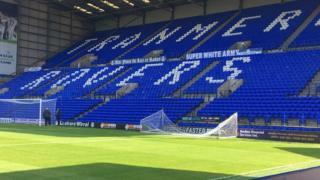 Tranmere Rovers Supporters' Club said it was "not remotely racist" and referred to their team's shirts. England's Lionesses had been embroiled in an ongoing row before Tuesday's match over discrimination allegations made against the team's manager Mark Sampson, who has since been sacked over an unconnected matter. The FA confirmed it took down the banner at Prenton Park but said it would be making no further comment. Supporters' club chairman Mark Bartley said the banner had been on display at the ground since the summer, but the words had "been our motto for years" and the decision to cover it "was a one-off [which] will have no impact on us". "We are proud of our club colours, as are all fans up and down the country... and will continue to use the chant at our games going forward," he said. "It is not remotely racist - it is simply a reference to the white shirts that our team wear." Tranmere Rovers FC declined to comment.